The Society for the Neurobiology of Language welcomes applications to host future meetings to be held each year between September 15th and November 15th. We seek to hold our meetings in cities that are of interest to our members (e.g., for their cultural, historic, geographic, or linguistic characteristics). The host city should be accessible from major cities worldwide. 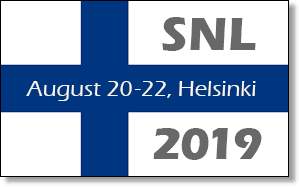 We require a local organizing committee headed by a member of the Society who will work with the SNL Meeting Organizer to finalize meeting arrangements. SNL is interested in receiving applications for US, Europe and other countries. All proposals will be reviewed by the SNL Board who will contact applicants for further information as needed. If you have questions, please Contact Us. Add additional Organizers (if any). Relevant information could include details of the cultural, culinary or linguistic environment, the weather, scenery or entertainment options. Please provide information about the proposed meeting venue. We require lecture space for 1,000 attendees and an exhibition hall for 100 posters. Detailed cost information is optional at this point in the selection process, but If you do have this information, please include it. Enter the name and address of the proposed conference venue. Include cost information if available and possible venue(s) for an evening reception. Enter the website address of the proposed venue. Enter the dates that this venue is available. What are the key features of this venue that make it suitable for the annual meeting? Are lecture rooms and exhibition halls in the same building? Please provide any additional information in support of your venue. Is there financial support (e.g. from local government or grants) to help with meeting organization? Are there any other factors – e.g. proximity to other language/neuroscience meetings, commercial support – that favor your application? You may upload files that provide additional information about the venue. Accepted file types: pdf, ppt, pptx. Please provide the following information about travel and accomodations. What are the flight connections to major cities in Europe, North America and Asia. Describe the travel time and transportation options to and from the primary airports attendees would use to attend the meeting. Describe availability and cost of accommodations that are within walking distance of the meeting venue. Describe the type and cost of public transportation that is available to travel between the meeting venue and local restaurants and attractions. Describe the local administrative team available to help with meeting organization, prior to and during the meeting.